For the living room, the kitchen or your bedroom, our bookcases collection offers a wide variety of design and styles to suit your mountain chalet's décor. Most of our models are handcrafted with solid woods such as pine or oak, giving your furniture a natural and traditional look. 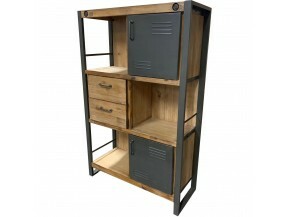 Ideal for storing your trinkets or books, our bookcases and shelves combine a modern, industrial and traditional style to make your interior unique.